Ah, Hot Dog on a Stick.. the funny hats, the workers jumping up and down on the lemons (do they still do that?? ), the memories! Hot Dog on a Stick Lemonade was hands down my favorite lemonade as a kids and teen. It just tasted better. I think it was all that jumping up and down. Basically when you squish the whole lemon into lemonade the oils come out of the peels and tastes good. Today I have a Kopykat Hot Dog on a Stick Lemonade for you, and no, we are not going to stomp our lemonade but we will work on the peels for a few minutes to get some of those yummy lemon oils to come on out. 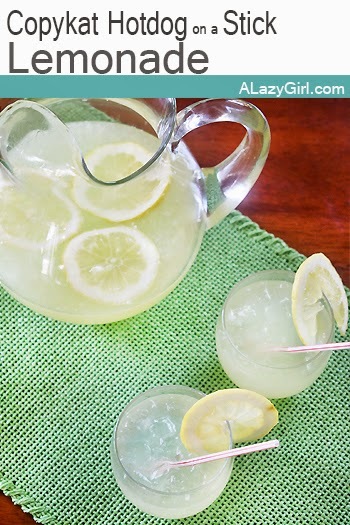 I hope you enjoy, this really to the best lemonade ever! Yum! I'll have to try this. It will be perfect for this hot summer weather. Thanks for the recipe!